Mamahood, Among Other Things...: Wow! I was so not expecting these. My first blog candies --yay! Three of them. Veronica from Of Mice & Ramen and and JenJen from GottaLoveMom both gave me the Blogger Buddy Award and I got another one from Veronica: the Zombie Chicken Award. Seriously, though --thanks so much, Veronica-of-the-Amazing-Photos and Motherhood-Incarnate, JenJen! Guys, do drop by and check out their sites. Fast-forward to the next year. I'm a presenter. 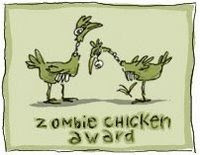 ”The blogger who receives this award believes in the Tao of the zombie chicken - excellence, grace and persistence in all situations, even in the midst of a zombie apocalypse. These amazing bloggers regularly produce content so remarkable that their readers would brave a raving pack of zombie chickens just to be able to read their inspiring words. 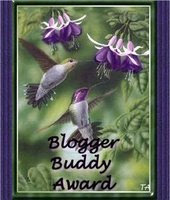 As a recipient of this world-renowned award, you now have the task of passing it on to at least 5 other worthy bloggers. Do not risk the wrath of the zombie chickens by choosing unwisely or not choosing at all…"
To heap upon all five winners more 'candies,' they all also get the Blogger Buddy Award! I love reading these five blogs for different reasons. Some of them make me laugh. Some of them contain a wealth of useful information. Some of them move me. All of them "regularly produce content so remarkable that their readers would brave a raving pack of zombie chickens just to be able to read their inspiring words." Enough said. Thanks for the mention! You rock! Hahahahaha! Goodness me, thank you thank you thank you! Glad to know you'd brave zombie chickens to read me. Hahahah! Oh my heart, zombie chickens. You're awesome. Hahahaha! Sorry for the late visit and reply...closet still a catastrophe and am pondering whether to leave it like that and let the man get used to it...or attempt to discard some clothes (gasp! horror!). Hopefully will get it done by the end of today (it's only 3pm so the day is still young, hoho) and get back to my blogging life tomorrow.